THUNDERBIRD RENDEZVOUS and REGATTA big Success! 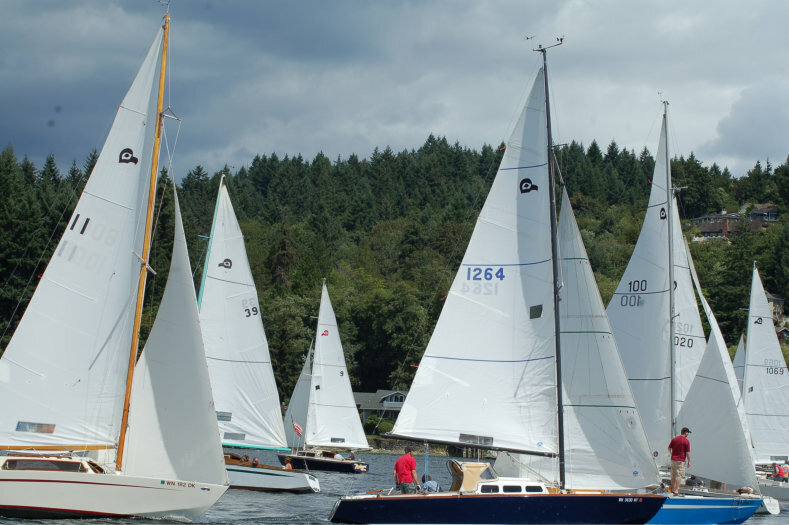 While Saturday, July 25, brought a welcome respite to the 90 F heat wave that enveloped Western Washington, the racing at the T-Bird Rendezvous and Regatta sizzled. Twelve “Birds” convened at their primordial home, the Gig Harbor BoatShop for some low key racing and high level partying. The event was co-hosted by Thunder bird Fleet 1 and the Gig Harbor Boat Shop and both groups are looking forward to more cooperation and collaboration. The racing on Saturday was like speed dating. Short courses located at the North end of the harbor and strong gusty winds kept the fleet together and in each others way all around the course. Also, the fleet elected to sail under white. There was no time to stretch out the fleet. In fact, the first race was over in 15 minutes. In a couple of hours, six races later, the race committee and sailors had had enough and returned to the BoatShop for a well-deserved libation. The ensuing party at the Boat Shop brought together not only T-birders but also the Gig Harbor sailing community and its friends. It was a perfect evening in a magical setting, the lasagna dinner and deserts from fellow House T-Birders, Mike and Suzanne Tunney, were outstanding, stories were told and probably enhanced a little. Trophies were awarded and 4 of Ed’s model T-birds were distributed by lottery. The evening wrapped up with a presentation by Mark Hoppen, son of Ed Hoppen, on life in the boat shop and the impact of the Thunderbird design and success on subsequent sail boats. To wrap things up, on Sunday a smaller fleet raced from the mouth of Gig Harbor to Pt Richmond, 10% 3.5 miles to the north. With 4-6 knots of breeze from the south east, it was ideal for a spinnaker broad reach to the mark. The trick was to find favorable current and to play the wind shifts. Of course having an auto pilotmakes flying the chute a lot easier for the short handed crews.